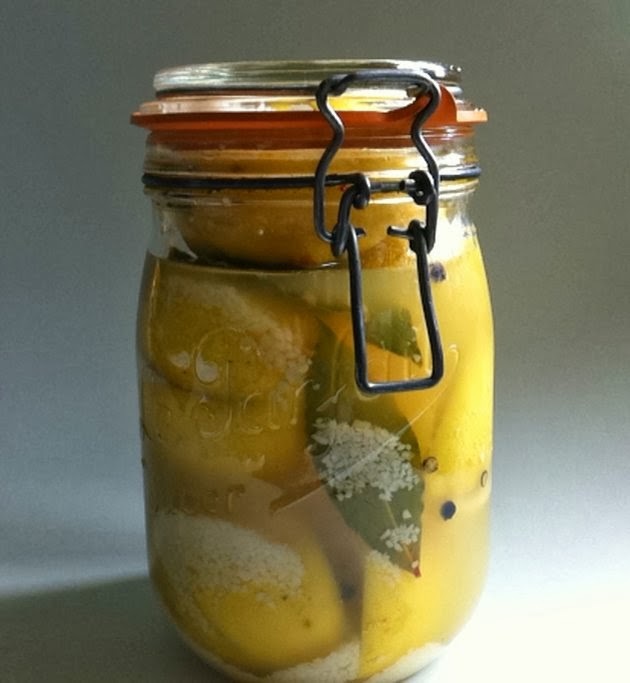 Preserved Lemons are Lemons that have been Pickled in Salt . The fruit develops a mellow yet intensely lemony flavour . A wonderful staple ingredient to have in your store cupboard and very easy to do . These will bring a ray of Sunshine and memories of hot summer days to your dishes over the Winter months. Many Mediterranean Dishes call for Preserved Lemons such as Rabbit Ragu where the lemons will add warm flavours, Black olive & Tuna Tapenade or even a Spelt Risotto, Middle Eastern dishes also call for tangy preserved lemons to balance out the sweetness of their dishes , such as a Tagine and Couscous . Wipe the lemons with a cloth dipped in warm water , to remove any wax that may be present . Cut the lemons in half but do not cut all the way , then cut in half again so that now you have a quartered lemon but still attached at the base . Pry the lemons open and pack generously with coarse sea salt . Place in a Sterilised jar and press down , adding a few peppercorns and bay leaf . Sprinkle generously with more salt and continue until the Jar is filled up . Top up with the lemon juice making sure it is well covered . Seal the jars and allow to sit at room temperature for at least 2-3 weeks , turning the jars upside down occasionally. Top up with more lemon juice if needed . Wash the lemons under cold water to remove the salt , Scrape out the flesh and discard . Pat dry the softened rind ,chopped finely before adding to your dish .